adjustable BCD for small ring! smallest position is 74mm, the outer is 102mm. 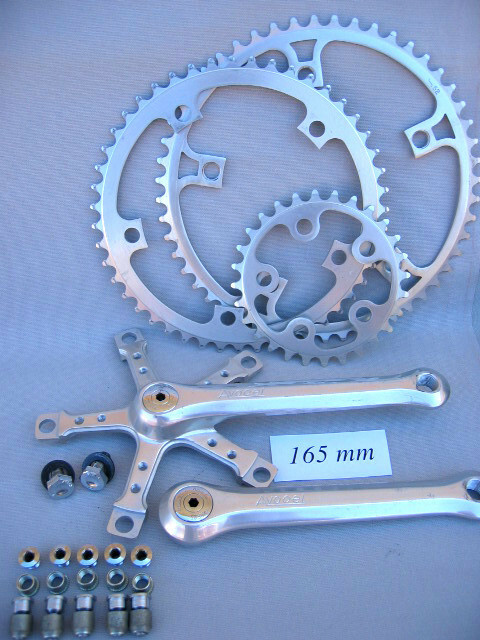 These were made by Ofmega for Avocet, and are the same as the Ofmega CX crankset. Avocet was a major Northern California component distrubution company. It was founded by Bud and Neal Hoffacker in 1976. Their first product was an anatomic saddle and they have a patent on saddles with thinned shells and bumps. After achieving success with the anatomic saddle, Avocet began importing and distributing Ofmega cranksets, hubsets and pedals under the Avocet name. In its early days Avocet was driven by the dream of producing "Made in the USA" bicycle components. They developed a line of super-quality hubsets, headsets and bottom brackets. They also built a large saddle factory. Unfortunately, foreign competition made these ventures uneconomic and the saddle factory moved offshore. Only Avocet cyclometers were now made in the USA. In 1985, Avocet developed FasGrip, a complete line of bald tyres. Currently Avocet's major emphasis is on saddles, cyclometers, tyres and shoes.